The majority of our destinations on this road trip are National Parks and towns surrounded by rivers and hiking spots, but there is a short list of big cities we don’t want to miss. That list includes Seattle. When thinking of Seattle, two things come to mind: fish and coffee. Great combo, right? With only a day and a half to explore the city, we knew we didn’t have time to do everything on the list. We definitely wanted to walk around Pike Place Market, but other than that we were open to doing something different. That is how we came across Rotie Cellars Tasting Room. 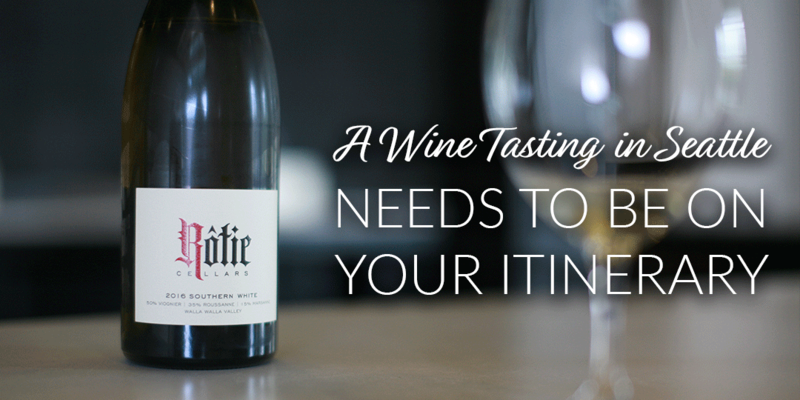 Conveniently located near downtown Seattle, a wine tasting in Seattle at Rotie Tasting Room needs be on your itinerary. 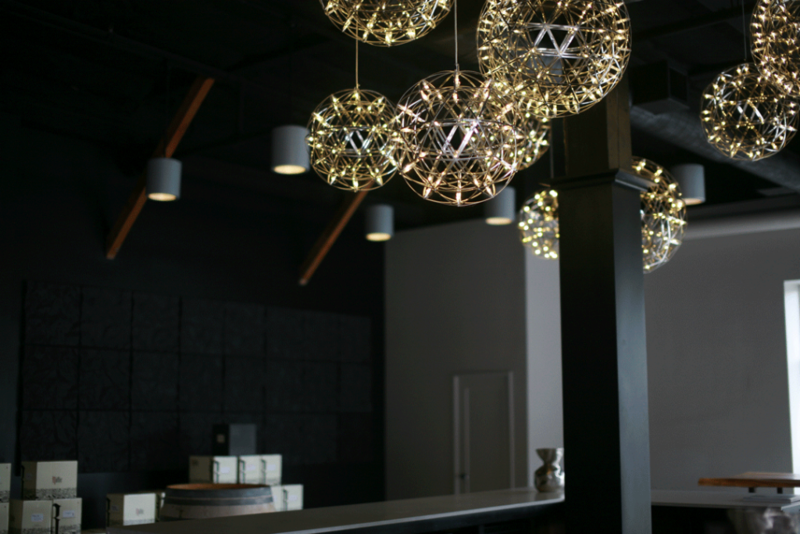 If you didn’t know the SoDo Urban Works building was full of incredible tasting rooms, you might drive right by. But that would be mistake. Pulling into the parking lot, we looked around and were amazed by all the tasting rooms. This was a great find! Rotie Cellars is perfectly positioned at the front of the building, which makes it a great starting point for your afternoon of tastings. 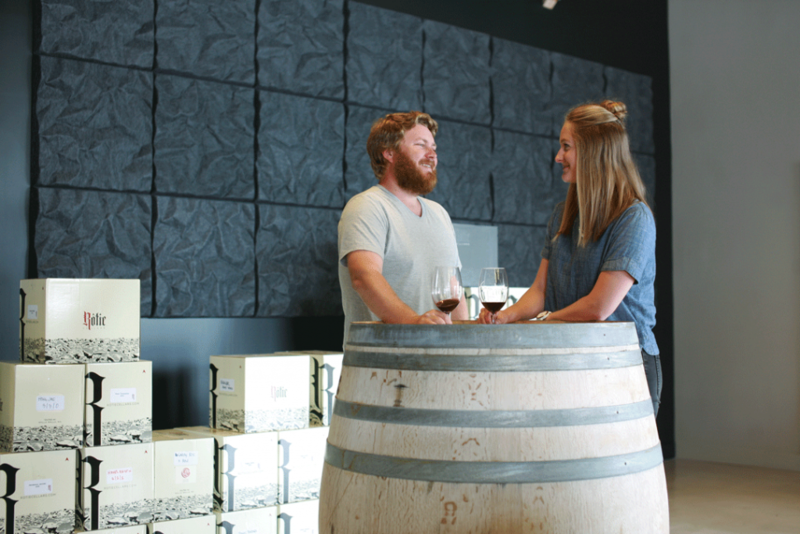 The tasting room has an open, modern concept with clean lines and a touches of natural elements. With tons of natural light and fresh air, it’s definitely a place you could spend the afternoon – sophisticated while being laid back. Inside we learned the building hosts tasting rooms from 7 different wineries, a taproom from Schooner Exact Brewing Company, and a Saki tasting room is scheduled to open soon. If you’re in Seattle on August 26, be sure to stop by. The tasting rooms are coming together to host a block party complete with live music, food and of course, wine! The vibe was great, but the wines were even better. With vineyards in Walla Walla, Washington, Rotie Cellars produces traditional Rhone varietals from some of the oldest and best vineyards in Washington state. Producing both reds and whites in “Northern” and “Southern” blends, you can taste and learn the differences the growing season, soil, topography, and climate have on the wine. We started the tasting with the 2016 Southern White, which is a blend of Viognier, Roussanne, and Marsanne. You can taste the honeysuckle and tropical fruit in this crisp wine. Following the Southern White, we tasted the 2016 Northern White. This White is a blend of Marsanne and Roussanne. This wine expresses characteristics of melon and citrus notes. As a fan of Roussannes, I loved them both while Luke favored the Northern White. The Southern White is a great “front porch” white, while the Northern White would be great with rich fish or pasta dish. Next, we tasted the Grenache Blanc, which is 100% Grenache Blanc. This was the first 100% Grenache Blanc Luke and I have tried. It was bright, crisp and refreshing. We learned the founder and winemaker, Sean Boyd, focuses on producing wines to taste as they should. 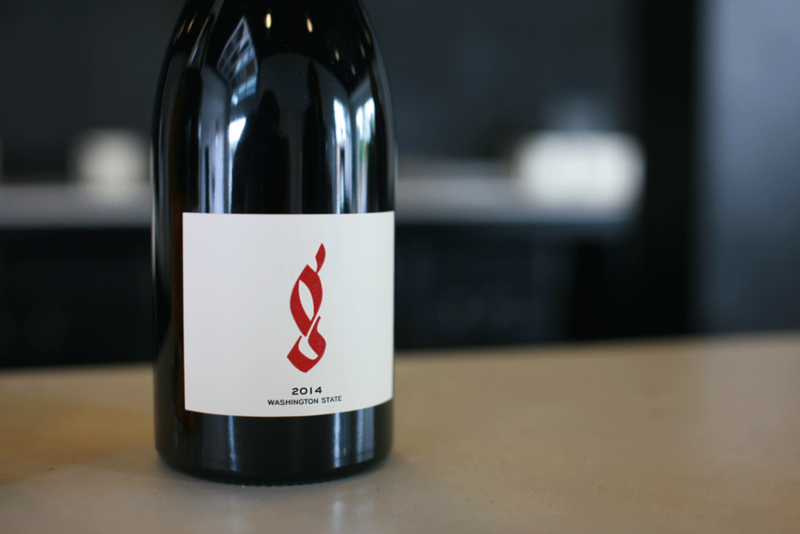 He doesn’t co-ferment Syrah with his Grenache to exact the color – the Grenache is Grenache, and it’s enticing. Up next was the Rosé. I’m not too picky when it comes to Rosés in the summer, but until this tasting, Luke had only found one other Rosé he liked. As we talked about Rosé, which seems to be the “trend” at the moment, we learned Sean isn’t into making a wine because it’s having it’s moment. He’s only going to produce wines he enjoys drinking making Rotie’s Rosé not your typical Rosé. The 2016 Rosé is 100% Mourved. It is bright and crisp with heavy florals. It’s not overly sweet yet refreshing with pomegranate and tangerine. This Rosé brings a whole other level of sophistication to my typical Rosé purchases. 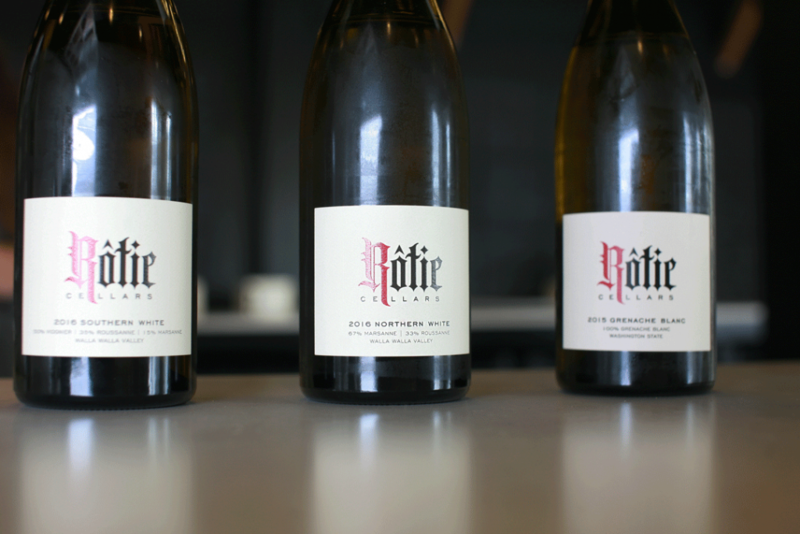 If these four wines aren’t enough to make you want to visit Rotie Cellars, then just wait until we get to the Reds. With special limited blends like “Little g”, “Homage”, and “Dre” in addition to the Northern Blend and Southern Blend, Rotie Cellars line up of reds is one you need to experience. The Northern Blend is made up of 94% Syrah and 6% Viognier with fruit from the Rocks District in Walla Walla. You can taste the earthy and rocky terroir. Tasting both the Northern Blend and the Southern Blend, grown in sandy soil, you quickly pick up on the impact the soil and climate has on the profile. “Little g” – he’s great. “Dre” – he is, too. Trust me, you’ll want to meet them. I have to say our favorite wine at Rotie Cellars is Homage. This is a big red wine with a blend of 75% Mourvedre, 15% Syrah and 10% Grenache. The Mouvedre comes from the Wallula Vineyard terraced on columnar basalt lava flows above the Columbia River. With Homage, you get pipe tobacco and beef jerky with notes of ripe red fruits, fig and date. If there’s a better combination out there, I haven’t tried it. The 2010 vintage was Rated 95+ by the Wine Advocate. From what we learned about Sean’s uncompromising approach to winemaking and quality, we can’t wait to see what other accolades this wine will receive. 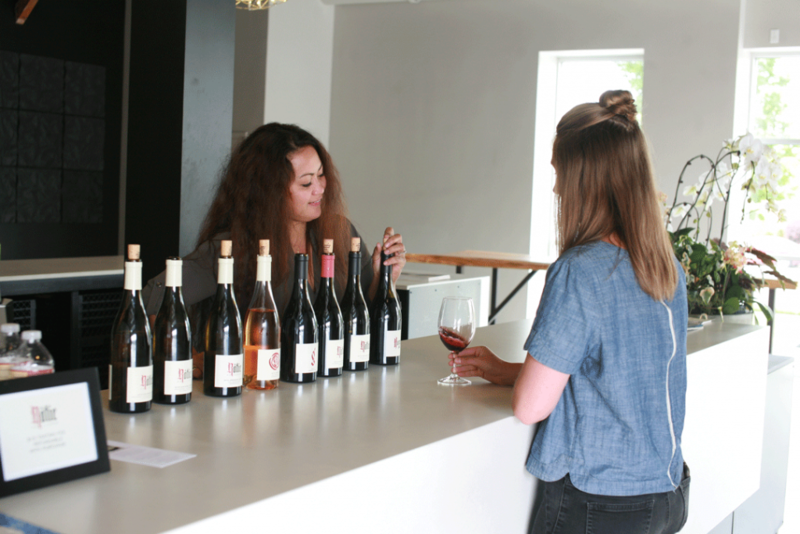 Next time you are in Seattle, make sure Rotie Cellars and the other tasting rooms in the SoDo Urban Works building are on your to-do list. Better yet, we should all make a trip to Walla Walla, Washington to visit the winery and join their wine club. 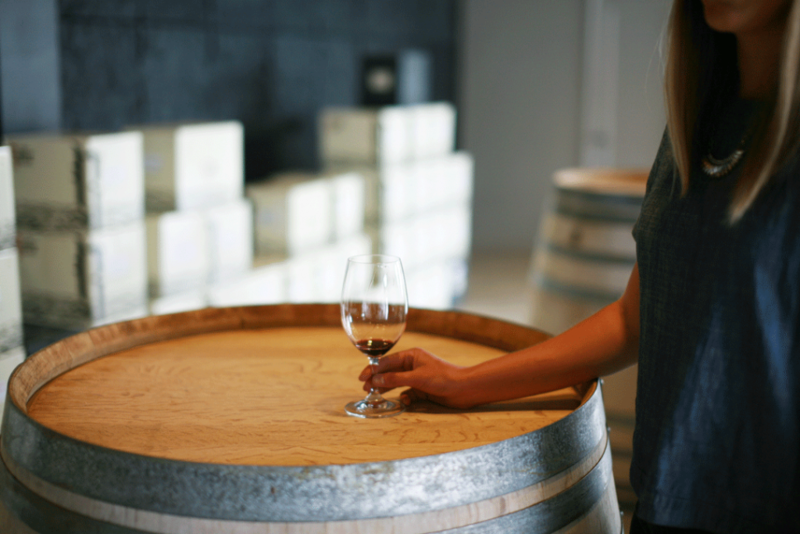 No road trip is truly complete with a visit to a vineyard or tasting room! Where is your favorite winery or tasting room? That sounds delicious! Thanks for the suggestion. Laura, you sure did an amazing job reviewing our wines. Thanks for sharing your experience at our SODO tasting room. What fun, fresh take on what we are doing. Come back again soon. Thank you! We had a great time. Next time we’re in Washington, we’ll have to visit Walla Walla. Hi Bo, that’s wonderful to hear! We enjoyed at time at the Seattle tasting room and definitely want to visit Walla Walla next time we’re in Washington. It looks beautiful!